High growth businesses have a couple things in common from a sales perspective: They get a lot of leads, close business quickly and close a higher percentage of their sales opportunities than other green industry businesses. 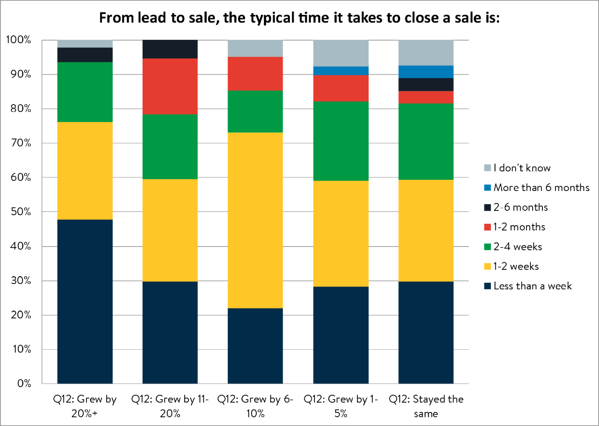 The biggest issue in a sales process based on year-over-year revenue growth tells us that those that grow quickly are more likely to say qualifying and following-up on information requests are their biggest sales issues. Their slower-growing counterparts are more likely to say that filling the funnel is the biggest issue. This finding points out that those businesses that grew a lot had too many leads – they need some way to qualify them and they need to find time to follow up. Those are issues that businesses with a lot of leads have. When you look at sales close rates, those businesses that grew by 20+% were most likely to say they closed more than 70% of their sales opportunities and less likely to say they closed less than 25% of their sales opportunities. But perhaps the most pronounced difference between high-growth businesses and their slower-growing peers is the time it takes to close a deal. Almost 50% of businesses that grew by 20% or more close business in less than a week, while everyone else was in the 30% range. That’s a significant difference. Improve close rates by analyzing lead sources. If you want to improve your close rates, one thing to do is examine your lead sources and determine if they impact your close rates. For example, you might get a lot of leads from referrals, and close a good percentage of them, and a similar amount of leads from a radio ad, but that ad leads to a lot fewer sales. Shifting your focus from radio to building a better referral program can help you improve your overall close rate. Touchpoints matter. Next, take a look at your sales touchpoints. How many are there? What are you doing at those touchpoints? Think about ways to shorten your sales cycle and improve each of those touchpoints. For example, I’ve talked to a number of customers recently about their sales process. One told me they were focused on improving their process so that they can get a potential customer to say yes when they’re on-site. They’ve got a process that includes bringing marketing materials, printing a sketch of the project design and a proposal on-site and capturing an electronic signature and down payment right there. Their goal is to close the business as fast as possible and limit the amount of time a sales rep spends following up. Differentiate yourself. Finally, figure out what makes your green industry business unique. The best way to do that is to simply ask your customers why they chose you and what they say when they recommend you. Leverage that information in your marketing mix and sales pitch. A lot of businesses aren’t great at articulating what separates them from their competitors. If you can articulate what makes you unique, you’ll not only likely close more business when you’re in a competitive situation, but you’ll also potentially be able to charge more than your competitors if your uniqueness is worth paying for. When buying products, casting a wide net for information about products is something high-growth companies seem more adept at than their slower-growing peers. The majority of respondents turn to Google to get information, followed by seller websites, distributors and then peers. High growth companies – and growth companies in general – were more likely to see higher levels of many different types of information resources when compared to those whose revenue stayed the same. So the takeaway – the more resources you consult, the better decision you’re likely to make. Build a network. I was at a distributor event last year and the owner of that distributorship gave a great presentation about the need to have a Board of Directors at your business. He said having a panel of 3-5 people you talked to regularly about the issues in your business, the future of your business, etc, would help surface differing opinions that could improve decision-making. You don't necessarily need to build a Board of Directors, but you definitely need to find folks that have experience running a business similar to yours. Relying solely on internet research or even knowledgeable folks like sellers and distributors is great, but there’s nothing better than having people who have been there before helping you make decisions. Don’t be afraid of salespeople. That said, you should also leverage distributors and sellers. We have partnerships with a number of distributors and I can tell you they know the products they’re selling inside and out. Many of them were either contractors in the past or worked for a contractor. They can not only help you understand new equipment and parts, but also how to design an irrigation system, for instance. Most distributors have events throughout the year. You’ll learn about new products and generally get a free meal out of it. Join a business group or trade association. Finally, get involved in local, regional or state associations. 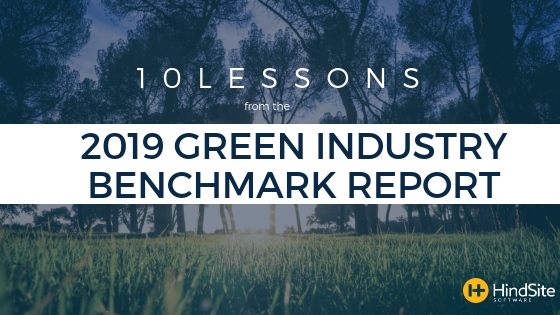 We’re connected to some great local trade organizations and exhibit at some of the larger national green industry trade shows. There’s a ton of knowledge to be learned by being a member of those organizations and you can build non-competitive peer relationships by attending. 9. Goal setting, especially long-term goal-setting, can help you grow short-term. Most businesses are setting annual goals, a few are setting quarterly and fewer yet are setting long-term goals. More than 10% set no goals at all. Meanwhile, businesses that grew were generally more likely to set goals. But those that grew the most were also more likely to set long term goals. This is a finding we’ve seen in every Benchmark Report. Businesses that set long-term goals seem to be more likely to grow short-term. That seems counter-intuitive, but businesses that take the time and have the vision to set long-term goals probably are more attentive to how they’re progressing in their short term goals. And having that long-term vision probably helps formulate better short-term goals. Take timeout to plan. First, spend a day discussing your long-term goals with your management team. Start with an outrageous goal 10 years in the future. Then, work backwards from that goal to set 5, 3, 1-year and quarterly goals. As we saw previously, a lot of businesses set annual goals, but many of them don’t set quarterly goals that help them achieve those annual goals. So they aren’t adjusting their strategy half-way through the year if they’ve missed their quarterly goals because they don’t have quarterly goals that roll up to the annual goal. Communication is key. Always communicate your goals with your team. For example, if you want to increase your customer satisfaction, create a scorecard that you review at every team meeting that shows your overall satisfaction and the customers that have lower satisfaction. It takes repetition for most employees to understand your goals and then take action based on them. So reinforce the importance of a goal with consistent communication. If you create a goal and only discuss it a couple times a year, people won’t think it’s important. Give everyone a number. Finally, make sure everyone has a number that helps you achieve your goal. For example, one of our customers uses revenue per hour as the primary number for a field employee. He wants them to hit a certain threshold. If they take their time getting parts from the distributor or take a long lunch, their revenue per hour could go down because they aren’t being productive during that time. When their manager reviews their revenue per hour, he’ll dig into why they weren’t productive and take corrective measures. By giving everyone a number, you’re setting their daily expectations. By aligning that number with a business goal, you’re helping your business achieve better results. 10. Acquisition may solve your labor issue. My final lesson wasn’t actually taken from any data in the report, but from a conversation I had with a business owner. This contractor was lamenting the fact that it was getting more and more difficult to find labor. Without the labor to do the work, he figured he couldn’t grow at his desired rates. His solution was to acquire other businesses. A lot of times, you’ll see acquisitions to enlarge a customer base. For him, an acquisition would help him add more labor to his business. It was the first time I’d heard a green industry business owner suggest acquiring a company for the labor. It’s common in the software industry, where businesses will buy a company not because of the products they create, but because they have talented software developers. But it makes sense given the labor shortage that exists today and the fact that there’s a lot of business available. Acquiring a company for their people might make sense. People Matter. Especially in today’s labor environment, you’re probably not going to be able to replace the people that are part of that acquisition. So make sure you find a company that’s a good cultural fit with yours. We have a number of customers and I’m amazed at how each of them seem to have a different culture. Some feel like a frat house. Some feel like a large corporation. Some feel like a family. Whatever your business resembles, you don’t want one that’s got an opposite culture. If you’re more corporate and buttoned up, you’re not going to be a good fit with a frat-like party culture. Also take into account technology and process. Will it be easy to transition employees to your business? Do you have processes in place that are similar? What kinds of technology are involved? Be prepared to lose some customers. Any change at the top is going to alienate some customers. Work toward 100% retention, but understand that it will be difficult to achieve. I’d recommend putting together some type of marketing campaign to your newly acquired customers to let them know who you are, what you do, and what the acquisition will mean. Do your due diligence. Don’t rush into an acquisition. Look at the books, talk to the staff, interview a few customers. It’s also worth consulting that peer network we talked about earlier. They may have experience buying and selling a business and can steer you in the right direction. Also, I’d recommend, if possible, examining a couple companies to see where there’s value, what different acquisitions look like and if your original choice is the best one. It’s always great to be able to compare two things when making a decision. This is part three of a three part series. You can read part 2 here and part 1 here.